Most of John Grisham’s courthouse thrillers take place in small Southern towns, and in just about every one of them there’s a small diner or luncheonette where the whole town, from the mayor, store owners and lawyers all the way through to the guys repaving the street outside gather for breakfast. Everybody knows everybody and the hard-working waitresses know them all. The food is home-cooked, simple, and very very good. I’ve never come across places like that in the novels of Faulkner or Morrison or Welty or Walker Percy, but I’m sure they were around back then. Their friendly, convivial tone just didn’t jibe with the atmosphere of pallid, haunted decay that those authors were trying to present. Brookside by Day is that kind of place. It’s been around forever — or at least since 1991, and though one of the owners, Tom Novak, quit a few months ago after twenty years of hard work, the other original owner, Kyle Phillips, is still greeting customers by the door. I’m a dinner kind of guy and the place closed at 2 PM sharp, so I didn’t visit nearly as often as I would have liked. But that’s changed now. Brookside by Day is now open by night. From Tuesday through Friday, they serve dinner until nine. The late evening sun was streaming through the windows earlier this week when I went to check out the dinner scene. You can’t see it in this photo of the homey main dining room but the sun was in full force in the smaller, more intimate room just beyond the bar where we chose to sit. 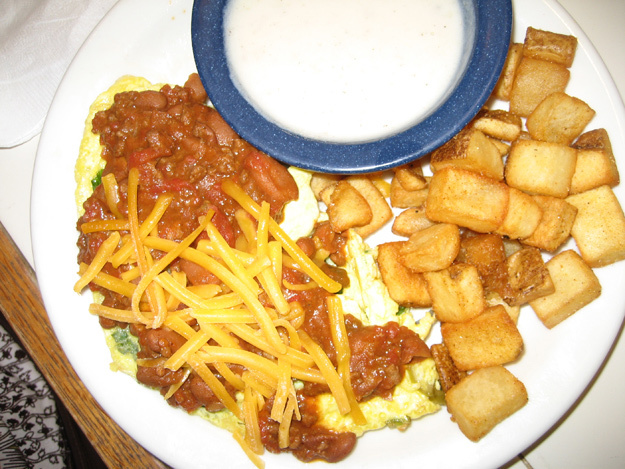 Their full breakfast and lunch menu is available, including their famous omelettes and breakfast burritos, as well as sandwiches, pancakes, quesadillas and burgers. On a huge chalkboard nearly covering one wall are written the dinner specials. You can get a half-pound ribeye for $13, or fried chicken ($11) or tilapia. There are pulled pork or roast beef sandwiches and a few other things that have slipped my mind. I ordered the fried chicken. And man it was huge! You get half a chicken. Instead of the breast, I opted for the back half, and somehow an extra leg got tossed in. That’s three drumsticks and two thighs there. The batter flaked when I tried knife and fork eating, so I discovered the time-honored Southern tradition of using my hands. The chicken was juicy, the batter was thick and crunchy, and it was just fine. I won’t say it’s the best in the world. It doesn’t even compare to the amazing fried chicken I’ve eaten at A-1 or Wanda J’s, but A-1 is, sadly, closed and Wanda J’s is about ten miles away in Broken Arrow. 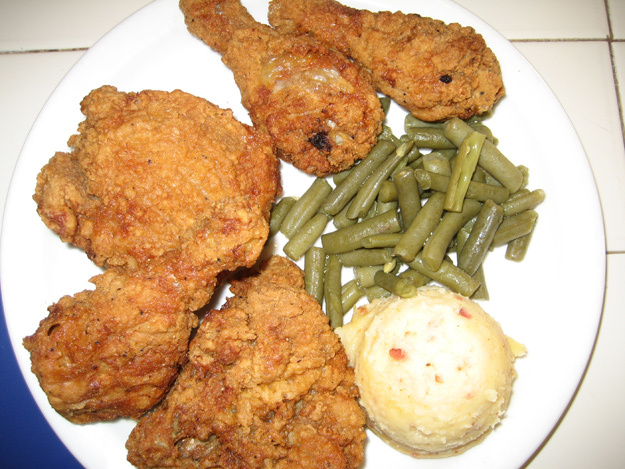 Fried chicken options closer to home are, sadly lacking (and why? fried catfish abounds in Tulsa) and this huge plate is a fine choice. Especially taking account of the delicious bacon-flavored mashed potatoes, covered with something rarer than it should be: tasty, flavorful white gravy. (The beans were just okay.) There’s even Texas toast, which I flavored with jelly from the jam rack on every table. 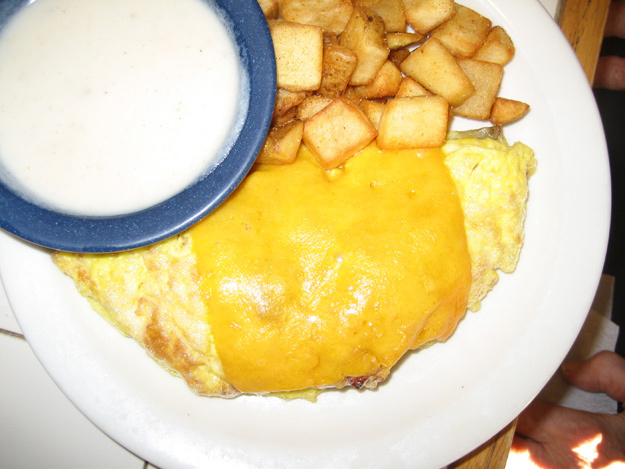 Or you can do as my friends did and get an omelet ($8.75). That’s what I used to do every time I visited for breakfast or even lunch. I remember those omelets as rich and fluffy, like clouds in Heaven. There are lots of options or you can design your own. This one had bacon, sausage, ham and Cheddar. There’s one called the Eye Opener that has onions and jalapenos and lots of chili on top. Cathe got that. I had a taste and it wasn’t quite as good as I remembered. But, in view of the many top-notch omelets I’ve eaten here I’d be happy to give it another try. 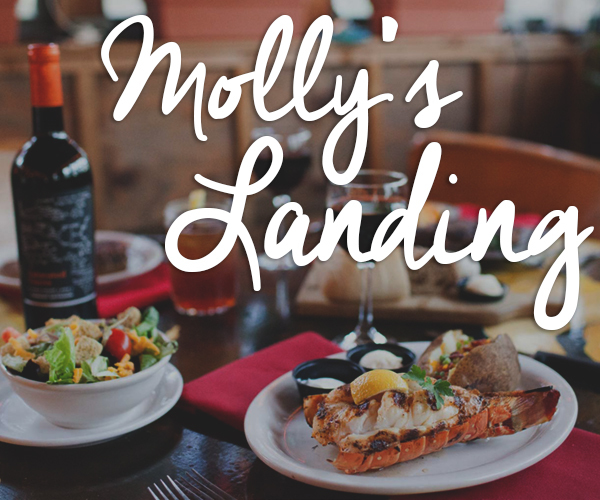 Open for dinner Tuesday through Friday 5:30 PM to 9 PM. Also open daily from 7 AM to 2 PM.